The most valuable companies in the world often have an immediately recognizable brand with a clear message. But the market value of a company’s brand is only half the picture. The brand’s relative strength compared both to its competitors and to companies in other industries is often much more indicative of the company’s future prospect. 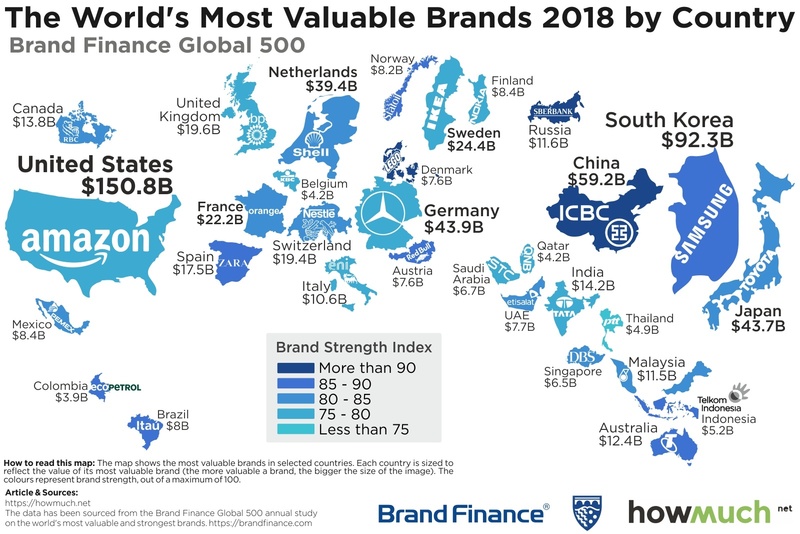 So we combined both measurements to map the most valuable brands in each country combined with a brand strength index score from Brand Finance. We got our numbers from the good folks at Brand Finance, who gave us a sneak peak at their 2018 list of the Global 500 most valuable brands in the world. They calculate the market value for the brand names of the most popular companies in the world, which includes the hard dollar value of a company’s assets as well as its trademarks, patents, and what accountants call “goodwill.” Then, Brand Finance scores the overall the strength of a company’s brand based on how it is perceived by customers, employees and other stakeholders. We created our map by adjusting the size of each country according to the market value of its most valuable brand, and we color-coded each country based on its strength. We did this same type of analysis last year. It’s interesting to flip between 2017 and 2018 versions of the map because it quickly demonstrates how the economy has changed in the past year. Amazon surpassed Google to become the most valuable company in the United States at $150.8B, thanks in large part to the acquisition of Whole Foods. And before Google, the most valuable American brand was Apple—meaning the top spot has changed 3 years in a row. Perhaps Amazon shouldn’t get too comfortable, unless they get those Prime Air drones to take off soon. Europe also has several highly valuable and strong brands, including Mercedes-Benz ($43.9B) from Germany and Shell ($39.4) in the Netherlands. The strongest brand on our map is Lego at 90.6, although the brand itself is worth comparatively less ($7.6B). They clearly have the market for plastic building brick toys cornered. China has the second strongest brand in the world in the Industrial and Commercial Bank of China (ICBC) at 90.3, a multinational banking company with a huge portfolio. ICBC puts China in elite territory with a very high market value ($59.2B). Another bank based in Russia, Sberbank, also cracks that 90-point threshold, coming in at 90.1 with a respectable market value of $11.6B. ICBC and Sberbank are both controlled by their respective governments, which makes Lego’s accomplishment all the more impressive. That brings up a larger point. Our map has a wide variety of different companies on it, but they generally fall into three categories: consumer brands, legacy manufacturers, and banks. There just isn’t the same dominance in other industries like insurance, health care or even brick and mortar stores. The main take away from our analysis is that a brand’s value and strength are not necessarily correlated. Sure, Amazon’s market dominance contributes to its brand, but the strongest brand (Lego) doesn’t even break the top ten in value. In fact, three countries in the top ten have brands with scores in the 70s, which suggests that the list will only keep changing next year.